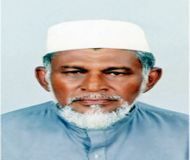 Ever since starting his career as teacher at Puttalam Zahira College in 1952, Moulavi Riyal has done a noble service to the Muslim society in Sri Lanka. After completing his tenure at Puttalam Zahira College in 1954, he was transferred to Kalpitiya Government School, which presently known as Al-Aksa Central College. He then served in the Training College training Tamil teachers for 2 years. In 1959 joined Mawenella Zahira Senior School. Thereafter he taught at Mattakkuliya Muslim School for 3 years. He then moved to Al-Hidaya Maha Vidyalaya in Maradana and served for 3 years until 1960 before joined Zahira College, Colombo 10 and taught there for 6 years. Serving in different parts of the country he also taught at Kingswood College Kandy from 1971 to 1974 – it is worthy of note that the present (at the time of writing this article – Nov 2013) All Ceylon Jamiyyathul Ulema (ACJU) president, Ash Sheikh Rizwe Mufthi has studied under him during this period at Kingswood College Kandy. After serving for over 20 years as a teacher under the Ministry of Education, Moulavi Riyal continued his services as a writer and advisor of the textbook Committee in Colombo Curriculum Development Center. From 1973 January to 1981 December he served as the Circular Education Officer (CEO). He was then appointed the Deputy Director of Islam and Arabic Education. He also was the Controlling Chief Examiner of National Institute Of Education (NIE). Moulavi Riyal served as the Education Director /Deputy Education Director for 17 years. He obtained Bachelor of Arts (Hon) degree from University of Peradeniya, Sri Lanka. He also acquired a Post-Graduate Diploma in Education at University of Colombo. He has obtained a special certificate for Imam and Katheeb training from Al-Azhar University Egypt. He was awarded with a degree of Kaathimul Ulama by Ihsaniya Arabic College Colombo. Was honoured with Shamsul Ulama degree certificate by Gampaha District Jammiyathul Ulema. Ampara District Jammiyathul Ulama awarded him with Sheikul Ulama degree. Moulavi Riyal received awards from Katheeb of Madheenathul Munawwara Mosque Madeena and Deputy Judge of Saudi Arabia through the Ministry of Muslim Affairs. Ministry of Cultural Affairs in Sri Lanka awarded him with Kalapooshanam Awards in 2006. Government of Sri Lanka also honoured him by appointing him as an "All Ceylon Justice of the peace". He was the Chairman of All Ceylon Arabic Association. He held the post of General Secretary of All Ceylon Jammiyathul Ulema (ACJU) for 25 years. He had been long standing broadcaster from 1952. He still involves with programmes produced and telecast by Sri Lanka Rupavahini cooperation. In addition to his service he has written several books, such as: Madheenavai Nokki (Recognised by the government of Sri Lanka as the textbook for Advance Level Islamic Civilization), Kaadiyanihaln Valikedu (Misleading of Kadhiyanees), Bookihal Venduma (Do Bookies Needed), Soodattamum Muslimgalum (Casino and Muslims) are to name a few. Served as the member of Qur'an Madrasas established under the patronage of Ministry of Muslim Cultural Affairs, Halaal food research group, Advisor in Ulama board and as the member of Ahadhiya School Syllabus coordination. Served as the Secratary of Ithihathul Muslim Committee as well. Moulavi Riyal has done yeoman service with great dedication and commitment to the Muslim community of Sri Lanka. He dedicated his life as a good teacher, an exemplary father and pious Ulema. Presently he is retired and mostly spends his time with his family. Yet, he is involved in serving the community in various ways and means he is able to do contribute.